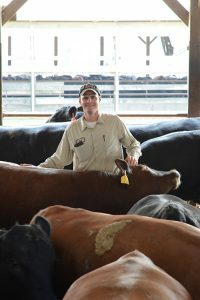 Since he was a young child, Ken Beever of Waterman, Ill., longed to be a farmer like his grandfather. Beever would follow his grandfather around, baling hay and other chores to help out on the family farm. “I love being outdoors and working with animals,” he said. Beever’s co-workers rushed him to a local hospital where he was stabilized before being transported by ambulance to the Level I trauma center at OSF HealthCare Saint Anthony Medical Center. OSF is verified for trauma by the American College of Surgeons (ACS) Committee on Trauma, and is the only verified trauma center in Rockford, and one of only two in Illinois. This verification ensures delivery of optimal care for injured patients. Tests revealed that Beever suffered an acetabulum (hip socket) fracture. Two days later, Jeffrey Earhart, MD, an orthopedic surgeon at OrthoIllinois who specializes in orthopedic trauma, and his team performed a five-hour surgery at Saint Anthony Medical Center to repair Beever’s hip.